Great piece, Bill! Instructive and entertaining! 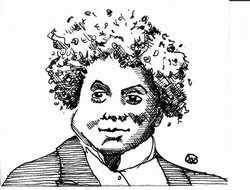 Dumas sounds like he would have been a real delight….a colorful literary character who enjoyed life and valued the craft. I look forward to your next piece! Thanks for an excellent piece. Dumas rules. And don’t forget REVENGE, the new abc show which is basically The Count of Monte Cristo set in the Hamptons! I was just going to say that, CptMoll. Last week they had a pretty clear adaptation of the scene where the Count turns down the chance to reunite with Mercedes.